It's been a week of baking failures, first I tried to make baked ricotta cheesecake (disaster!) and then I tried to make chocolate and beetroot cake (even more of a disaster!) So, needless to say, I was feeling rather disheartened. It's not fun to fail! So, to cheer myself up I decided to make something that couldn't possibly go wrong - biscotti. Luckily for me, nothing did go wrong and I redeemed myself in the eyes of well... myself. I love biscotti, there's something lovely about it. Maybe it's the fact that it needs to accompany a cup or tea or coffee, two things that I rather like. This biscotti isn't bad, but it's certainly let down by the fact that it contains instant coffee, however I'm not sure how to get the coffee flavour and the speckled look without using it. 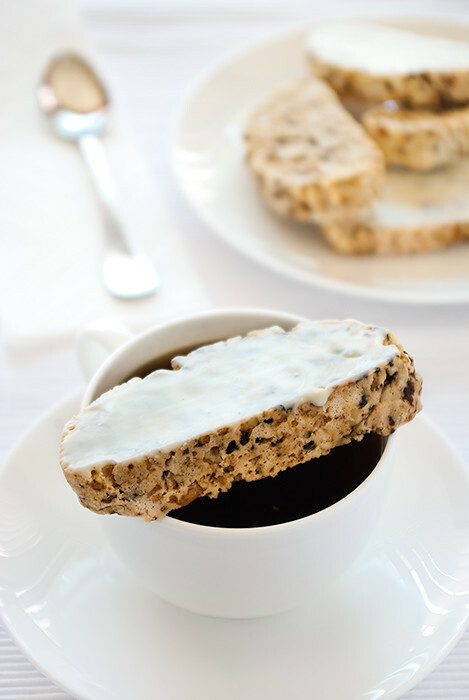 This biscotti is certainly pretty and the use of white chocolate rather than dark makes it deliciously sweet - nicely offsetting the bitterness of the coffee. If you don't mind the instant coffee taste, this biscotti is rather good. Dripped in coffee it makes for a tasty, tasty afternoon treat. Preheat the oven to 180°C (350°F), line an oven tray with baking paper. Whisk the sugar and egg in a medium bowl until combined. Sift the flours over the egg mixture, then stir through. Stir in the coffee granules and walnuts. Shape the dough into a 20cm (8 inch) log and place it on the prepared tray. Bake for 30 minutes, then cool on tray. Reduce the oven to 150°C (300°F). Using a serrated knife, cut the log diagonally into 1cm (1/2 inch) slices. Place the slices, in a single layer on to the tray. Bake for 30 minutes, turning the biscotti halfway through so ensure both sides are cooked. Cool on wire racks. Melt chocolate in a heatproof bowl over freshly boiled water. Spread one side of each biscotti and stand at room temperature until set. Serve with coffee. Yum! That looks super delicious! Your photos are amazing too. How do you make it look so much like a magazine??? Rad. 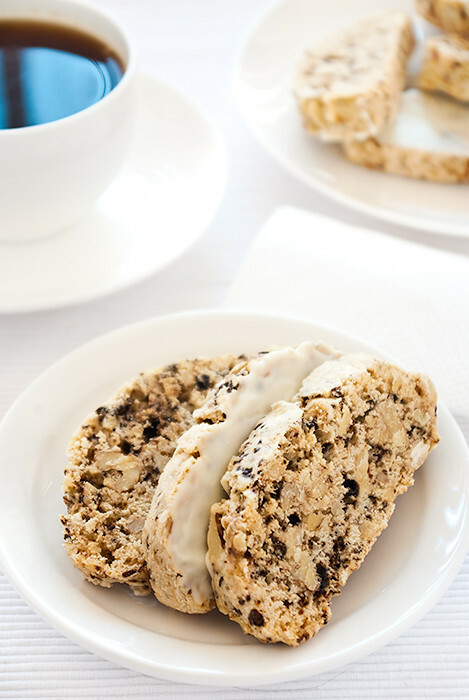 I adore biscotti, yours look lovely! The white chocolate on top adds a nice touch. At least your pictures look wonderful. If you want a really great and pretty biscotti recipe, try the Mosaic Biscotti from Gina DePalma's Dolce Italiano book. Soundless_space: Thank you, I love biscotti too. Anon - Thanks, I'll definitely check out that recipe.